So much has been written and documented about South African Art, particularly in the past two decades. 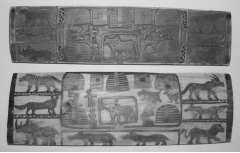 It is a vast subject whose origins lie in the ancient form of rock art but because of its history of colonization and subsequent devising of societies from 1910 to 1994, (resulting in immense socio-political upheaval), it has more divergent and widely contrasting forms of art than any other country in Africa. And it is just because of this fact that there are large areas missing in the recordings of modern South African art and this of course alludes primarily to the work of indigenous black artists. 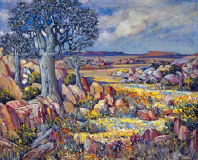 The end of the 19th Century saw continued European settlement in the country and in 1871 the first South African art society was formed; the S.A. Fine Arts Association, followed in 1902 by the South African Society of Artists, a member of whom was Pieter Wenning (1873-1921). The first South African Art Gallery was established in 1895 in Cape Town with well over 100 bequeathed works in the Collection being declared the property of the Cape Colonial Government in 1986. These paintings and sculptures largely featured English and European artists including Masters. This highly valued collection can be viewed today as part of the national treasure to be conserved and safeguarded in perpetuity. Towards the end of the 19th C artists such as Hugo Naude, Frans Oerder, Jan Volschenk and the sculptor Anton Van Wouw started to establish a locally embedded art that engaged with life in South Africa. By 1902 the primacy of South African art subject matter was seen as the way of fostering a sense of national identity. 1910 saw the end of the colonial era with the establishment of the Union of SA. In the Transvaal, the Johannesburg Art Gallery was formed in the University of Witwatersrand and a new building designed and opened to the public in 1915. By 1926, Long Street in Cape Town was a thriving road of artists including Naude and Gwelo Goodman and South African Art was well established. At this time it is very difficult to ascertain whether the European artists had any contact with indigenous artists. Their craft was almost certainly being admired and collected for curiosity but not pursued for collaboration or amalgamation by fellow artists as another current art form. However there are a few exceptions where artistic talent was recognized and nurtured even if it was a black artist adopting Western style. 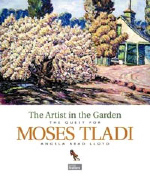 Tladi was the first black artist to be formally exhibited in South Africa, two oils and six drawings under the title 'Special Exhibit by Native Artist' at the Selbourne hall, Johannesburg in 1938. His inspiration came from the garden where he worked. Today the Johannesburg Art Gallery has 3 of his paintings in their permanent collection. In the 1920's craft was essentially rural and traditional, as in utility driven. But by the 1930's with the introduction of taxes on chiefdoms, black people were driven into labour and it became necessary for craftspeople to make a living from their craft. Certain magisterial authorities recognized the need to nurture talent and to produce quality items of craft that went beyond their usefulness.Two distinct outlets for crafted items now occurred; community based for functional objects and a white market for curios. 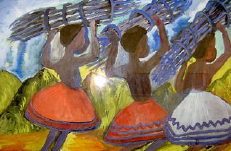 In Zululand and Natal, certain individuals crafted works that are to be found in Museums today and appreciated for their originality and skill such as Samuel Makoanyane, the Qwabe brothers and Hezekiel Ntuli. The Gwabe brothers carved wooden relief panels that are not only important in their own right but also because they undeniably influenced what was to follow at Rorke's Drift with their relief printing. Ntuli who started his artistic life sculpting clay oxen moved on to portrait busts and leopards with great commercial success. There was a continued desire by patrons of South African art and authorities of influence to keep black artist's work tribal and thereby 'authentic'. What would we have seen develop if they had been allowed to absorb the new techniques, methods and styles they were exposed to and at the same time self express? Gerard Benghu, 1910-1990. 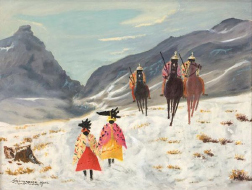 Benghu grew up in a mission school and in 1926 to 1931, the Dept of Education provided him with a studio where he painted beautifully rendered realistic portraits of rural Bhaca life and culture. 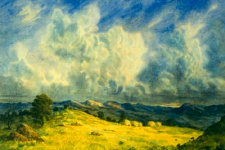 What he loved to do was paint landscapes such as this one of his local area, Southern Kwazulu-Natal but he was discouraged by his mentors to rather concentrate on capturing the romanticized visions of a lost paradise that Westerners seemed to require. In his later years he lived in Cato manor shackland near Durban, painting in sepia and wash as he couldn't afford colour. He did however receive commissions to paint friezes for public institutions and churches and they had a huge impact on those who viewed them, so unused were they to seeing black artists work depicting rural scenes in a contemporary way. George Pemba, 1912-2001 Pemba was one of the 'Thirties Generation' of pioneer black artists. His work spans 7 decades of South Africa's troubled history and his life story reflective of the divided society in which he was forced to exist. But today he is recognized for his contribution to South African art and his work is acclaimed and sought after. His work shows great integrity and a passion for painting his Bantu surroundings both rural and township. He was also a playwright, an illustrator of books and an activist. He won his first prize in 1937 and by 1940 was producing regularly and successfully for the exhibitions of the Eastern Province's Society of Arts and Crafts. In the 1940's he was producing exceptional watercolours but later turned to oils under the suggestion of Gerald Sekoto who felt that South African's preferred solid paint and effectual colour. "I felt inspired by the spirit of my past and my strength grew with the task I had in front of me: To capture the essence of native South Africa." At the Durban International Club exhibition of black artists he sold every piece of work. But by 1965 he was being marginalized not only for the colour of his skin but for his lack of formal training which meant he was shunned in the face of the art elite and the dogmas of their 'Moderism'. Fortunately he received financial support from a UK anti-apartheid fund that allowed him to carry on painting for over 20 years. South African art rediscovered him in 1989 thanks to Steven Sacks and his work appeared in the exhibition 'The Neglected Tradition'. In the late 1980's and early 1990's he turned to portraying the depiction of overtly political themes that reflected the turmoil of the dying days of apartheid. John Koenakeefe Mohl, 1903-1985 Koenakeefe Mohl is noted for two things besides the quality of his art to be appreciated for its own worth: He created the first school for black artists in Sophiatown, Johannesburg and he also refused to paint subject matter that others felt he should be painting. He loved to paint delicate atmospheric landscapes and stated 'But I am an African and when God made Africa, he also created beautiful landscapes for Africans to admire and paint.' This firm resolve was possibly formulated in his early adult years when he went to art school in Namibia and then to Germany for 5 years perhaps escaping the dominance of the governing bodies he was forced to live under. 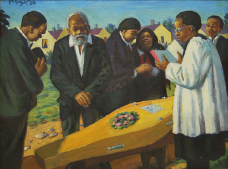 After the demise of Sophiatown he moved to Soweto where he shunned the formal approach to exhibiting and chose to show his work either at the monthly 'Artists under the Sun', in Joubert Park, Johannesburg or out of his home in Moroka township. He continued to paint, much like his peers, township scenes of the newly urbanized black populace residing on the edge of the 'white' cities. He worked mainly in oils, often in monochromatic hues to capture the essence of the morning mists, rays of sunshine through clouds as labourers toiled, rainy scenes with people wending their way home after a day on the mines; these are the kind of themes that are captured in his gently rendered paintings. Gladys Mgudlandlu, 1925-1979 Mgudlandlu was a self taught artist, born in the Cape and the first black woman artist to exhibit in public and have her work displayed in a Gallery (1960). She had an uninhibited use of colour and unusual perspective and was proficient in most mediums from pen, charcoal and wash, to gouache and eventually oils. In 1979, her work was selected to appear in two notable exhibitions; Contemporary African Art in South Africa and The Neglected Tradition. 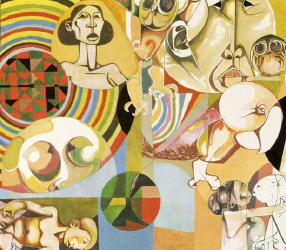 Simon Lekgetho, 1929-1985 Lekgetho is an artist who is being slowly recognized for his contribution to South African art. Under some guidance from Walter Batiss he painted landscapes, portraits and still lifes in traditional manner but his subject matter was quintessentially African featuring calabashes, bones, gourds, beads, shells, grinding stones; he was very concerned with making marks that reflected his culture. His portraits were quite other-worldly with haunting qualities and a strange, quiet mystery about them. 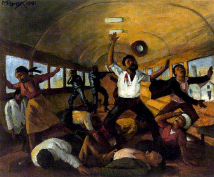 As an artist he had his own studio by the 1950's and he also taught art to his own community.